Tell us when Navitrans was established, who owns the company today and where you are headquartered? Navitrans was established in 1979, initially created to provide liners representation in a few west African countries. Since Navitrans take over in 2015, partial at first stage, Navitrans has grown tremendously, growing from 8 countries to 20 in two years. We are a fully private company and owned by Mr and Mme Vedrine. Navitrans head office is located in Nyon, Switzerland, in the canton of Vaud. What are your main activities in Navitrans – we understand that Africa is very much in your focus? Africa is clearly at the heart of our operations and day to day developments: 18 out of our 20 countries covered are in Africa. Navitrans has always been, since day one, linked to Africa and will continue to be. Our vision is to be the most sought after and respected service provider in the Marine, Freight Forwarding & Project industry in Africa. Services provided by the Navitrans Group are many and allow our clients to focus on their core business. Permitting to use one single partner across the whole logistic chain (from ship agency, husbandry and procurement to freight forwarding and custom brokerage), Navitrans has helped to build up significant savings, considerably simplifying communication and streamlining processes. Our vessel MV LAETITIA V when the vessel was in Singapore before the mobilisation to Africa. Africa is a huge continent and very diverse, in which parts of Africa would you say that you are best able to solve problems for your customers? We are supporting our clients all throughout Africa, using our own offices or third-party agents carefully selected and vetted. Navitrans is present in many countries and has very strong offices notably in Ivory Coast, Ghana, Nigeria, Equatorial Guinea, Cameroon, Gabon, Congo, DR Congo and Angola. Using it’s logistics and intra-Africa market know-how, Navitrans has been able to successfully develop a strong area of services, matching the needs of our customers and partners. To solve client problems it is compulsory to have the right tools and sharp know-how. Experience, strong management and operational teams, limiting to the maximum sub-contracting are key to the right service to our customers and their projects. We are not afraid to dedicate staff and/or teams to projects and add assets to meet client requirements. By trusting the Navitrans group, our clients have made the choice of long term partnership and dedicated services, matching their needs. I understand that you have built a landing craft vessel tramping between various ports in the West African region – can you tell us more? Navitrans has never been shy of investing to create additional integrated services. Our clients have been pushing us to create new solutions in Africa, allowing them to improve their supply chain, alternatives to the current market and limits of it. The vessel is brand new since it was launched in the end of 2017. – Offshore deliveries for bulk cargo. The vessel is currently trading regularly between Abidjan, Ivory Coast and Luanda, Angola. We have also been spot chartered out of these perimeters with calls in South Africa, Namibia or Mauritania. What are the main problems that logistics companies face generally in Africa or the parts of Africa that you serve? Operating in Africa requires strong know how and resources to meet with the requirements and deadlines. We are often see communication issues within same client entities or between suppliers and end clients. Every country is different and the lack of communication and knowledge can have seriously impact the supply chain fluidity and fines can be very high if the processes are not strictly followed. Working with the right agent is the key to prevent misunderstandings and issues when cargo arrives in-country. Navitrans has decided to invest in assets and our own licences, keeping under control the key aspects of the supply chain and making sure that every single step is in-line with defined processes and regulations. Do you have your owned offices located in Africa and if so where? 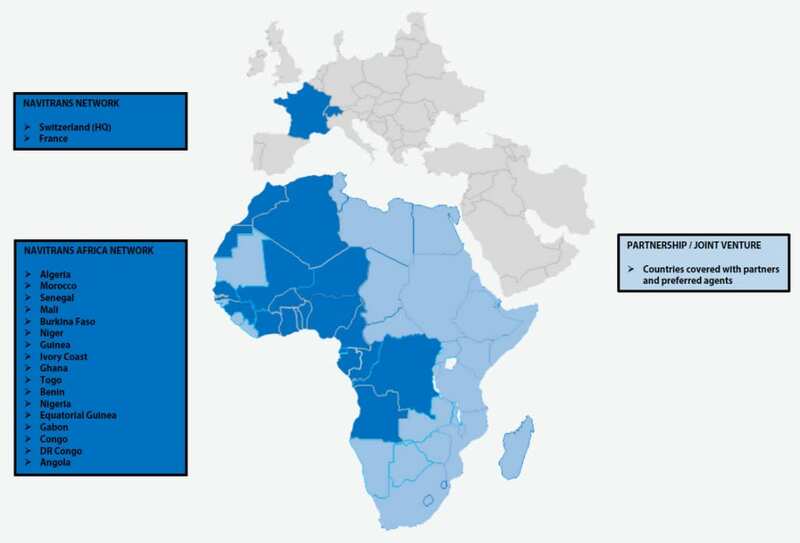 With 18 countries ranging from Algeria to Angola, including land locked countries linked to West Africa main ports, we cover already a very large part of Africa with own offices. The key hubs are of course covered with Algeria, Senegal, Ivory Coast, Ghana, Nigeria, Gabon, Congo and Angola. Main ports to land locked countries as well (Togo, Benin, Cameroon), covering always both ends to control perfectly all the steps of the cargo transfer including border clearance. Accessing Mali, Burkina Faso, Niger, Chad and Republic of Central Africa are key to projects, notably construction and aid relief. Last but not least, we also cover markets such as Guinea, Equatorial Guinea and Congo DR, aiming to offer global solutions to (but not limited to) our mining and oil & gas customers. Of course, we do handle hundreds of projects across Africa and we have been performing global door to door projects in Mauritania, Namibia, Ethiopia and Kenya recently to name a few. When did you yourself start your career in shipping, Loic? What made you enter the Africa trade? My father was a ship agent with three agencies in South of France. I had the opportunity to learn early the values of hard work, discipline and ethics. Values that are matching perfectly the ones we have at Navitrans. I had the chance to meet with Alain Vedrine, Navitrans CEO, in his previous venture and gained experience in Africa, notably in Nigeria and several other countries. Navitrans is a big family and the team spirit and excellence are key values. I do recommend every highly motivated and eager-to-learn person to apply for jobs at Navitrans, a great learning school with a clear future as market leader. It is pretty easy to reach out to Navitrans. And finally, we do publish on our LinkedIn page a lot of infos on our new offices openings / solutions: https://www.linkedin.com/company/navitransgroup/ or Navitrans SA in the search cell. We look forward to any enquiry and would like to thank you for the opportunity to present our group and its African network.